What to do on a rainy day by the sea.. ? Tips for A Rainy Day by the Sea. I think we must admit that England doesn’t have the most reliable weather! So, even though Bournemouth is one of the sunniest places in the UK , it also boasts a mercurial micro climate and rain does sometimes fall! So, if you find yourself washed out or just a little damp during your stay with us at the Bournemouth Beach Lodges, fear not – we have a few suggestions to give you some inspiration. 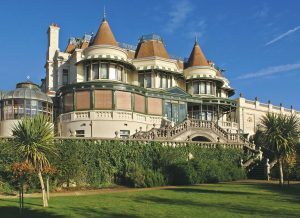 The house was originally gifted by Merton Russell-Cotes to his wife , Annie , as a birthday present in 1901 and was one of the very last Victorian houses to be built in the country. Observe the many beautiful artefacts from their travels around the globe as well as enjoying the eclectic permanent collections of art and sculpture or catching one of the many temporary exhibitions that visit the museum. The current show gives us a glimpse into the pioneering days of photography and long haul travel with China :Through the lens of John Thomson 1868 -1872) . On until June 2nd 2019. If you’re feeling peckish after all that art appreciation The Russell-Cotes Café , situated in the modern airy wing of the museum, serves a delicious range of light lunches, teas, coffees and cakes. For something a little more fast paced visit Rock Reef on the end of Bournemouth Pier for some indoor adrenaline pumping – clip n ‘climb walls, a vertical drop slide, a leap of faith jumping challenge or a high ropes aerial obstacle course. When the rain stops, however, the Zip Wire running from the end of the Pier to the beach is an exhilarating must-do experience! While you’re in Bournemouth there are plenty of other places to fill your afternoon. Just a stone’s throw away is the Oceanarium. 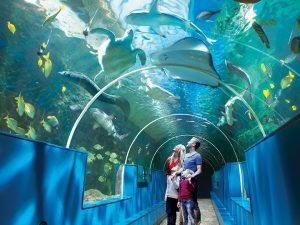 Here you can choose to just take a quick tour around or maybe stay to catch the feeding times for the Penguins, Otters and Sharks! If you’re more of a fan of the furry friends rather than the sea creatures, you may want to have some lunch at the Pause Cat Café. They provide a range of healthy and delicious meals whilst you relax amongst their friendly cats that inhabit the café. (Booking is essential and there is a £5 entrance fee). Alternatively, Bournemouth’s newest attraction , the Upside Down House in the buzzing , vibrant Triangle area is a quirky , fun way to spend 30 minutes in the very centre of town near a wide variety of shops, cafes and restaurants. End the day with a trip to the cinema. Catch a blockbuster at the Odeon in our new BH2complex overlooking the world class Bournemouth Gardens . If you want more of an intimate cinematic experience, head over to the UK’s smallest cinema at The Colosseum in Westbourne. You could alternatively choose to see live performances at The Pavilion Theatre or The Shelley Theatre – located just 5 minutes from the Beach Lodges! Bournemouth isn’t short of places to eat, so why not have a lovely meal out with your family or friends. Bournemouth – so much more than you think!